Keywords: 1, 3, 4-Oxadiazole, therapeutic worth, anticancer, antimicrobial, antioxidant, isoforms. Keywords:1, 3, 4-Oxadiazole, therapeutic worth, anticancer, antimicrobial, antioxidant, isoforms. Abstract:1,3,4-Oxadiazole, a five-membered aromatic ring can be seen in a number of synthetic molecules. The peculiar structural feature of 1,3,4-oxadiazole ring with pyridine type of nitrogen atom is beneficial for 1,3,4-oxadiazole derivatives to have effective binding with different enzymes and receptors in biological systems through numerous weak interactions, thereby eliciting an array of bioactivities. Research in the area of development of 1,3,4-oxadiazole-based derivatives has become an interesting topic for the scientists. A number of 1,3,4-oxadiazole based compounds with high therapeutic potency are being extensively used for the treatment of different ailments, contributing to enormous development value. This work provides a systematic and comprehensive review highlighting current developments of 1,3,4-oxadiazole based compounds in the entire range of medicinal chemistry such as anticancer, antifungal, antibacterial, antitubercular, anti-inflammatory, antineuropathic, antihypertensive, antihistaminic, antiparasitic, antiobesity, antiviral, and other medicinal agents. 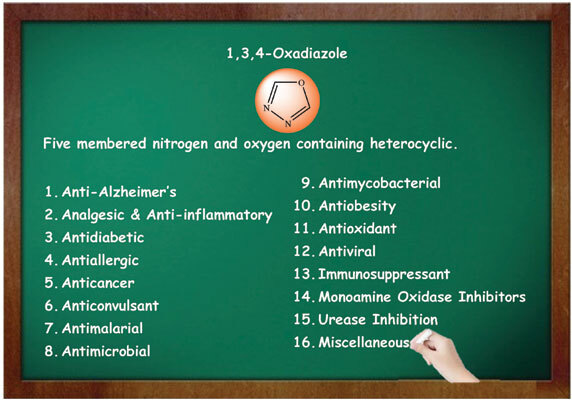 It is believed that this review will be of great help for new thoughts in the pursuit for rational designs for the development of more active and less toxic 1,3,4-oxadiazole based medicinal agents.